CCEE Stampers: What a bunch of Goofballs! What a bunch of Goofballs! 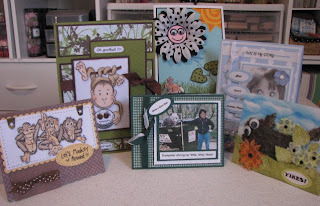 Who'd a thunk that a group of my friends/goofballs lead by Lilluvsstampin (Charlene) would challenge each other to make cards in honor of me being the #1 goofball! Well, that's the story! The challenge was to make a card for a goofball (mwahh) with googlie eyes on it! My sincere appreciation and thank you (I think!) to these fellow goofballs for sending me the likes of dead frogs, possessed babies, dumpster diving rats by the name of Harley, monkeys just wanting to golf, more monkeys just plain out-of-control, and goofy eyed polka dotted flowers surrounded by friends!! 2. DawnL (Dawn) - Dead Frog Goofball Card - Its really a dead frog! 3. Wannabcre8tive (Shirley) - Dumpster Diving for Wild Wild West with Harley Goofball Card! 4. Cindy_H (Cindy) - Let's Monkey Around Goofball card! 5. StampOwl (Frances) - Oops! I thought you said golfball not goofball Goofball card! 6. Lilluvstampin (Charlene) - Possessed Baby Goofball card! Way cool Cindy!!! Fabulous cards from some truly FABULOUS people...even those who send dead creatures....ewwwwww!! Lawd,this was such a fun challenge for a fun friend! You're the bestest! This goof ball challenge was so much fun. I had a good time with it and loved what everyone else came up with. We sure got a lot of laughs out of this.